4 negatives : b&w; ; 120 mm. Published in Rafu Shimpo, May 11, 1967 and May 12, 2008, Japanese section. Japanese cartoonist Ryuichi Yokoyama and group top cartoonists of Japan arrive at the Los Angeles International Airport, Los Angeles, California, May 11, 1967. Yokoyama wears suit with boutonierre, beret and tinted eyeglasses. 1N: Yokoyama leads nine men in suits, waving at viewer, down Japan Air Lines (JAL) ramp stairs. They are identified (bottom to top): left, Yokoyama, Hiroshi Oba, Masayuki Mineshima, Ichiro Tominaga, Mr. Kojima; right, Yukio Sugiura, Hidezo Kondo, Fuyuhiko Okaba, Tatsumi Nishikawa, Noboru Baba. 2N: Yokoyama sits with group of men and women in a lounge with JAL bag on coffee table in foreground. 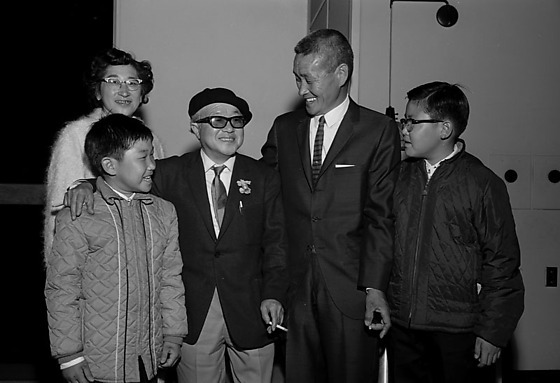 3N: Yokoyama stands with family of four and holding a cigarette. Typed on original envelope: Japanese Cartoonist at Airport -- Mr. Yokoyama Ruichi and 9 People.